This post features jan-u-wine's new poem, The Road Back. In it, the Shire is lifted up, as perceived through the senses of Frodo. Jan's poem was actually inspired by a 19th century English landscape called "Twilight", painted by William J. Webbe (for more about Webbe, or Webb, go here). I think it's a magical painting, and deeply Shire-ish. As soon as I saw it I thought, "Frodo walked here, Frodo saw this, Frodo laid in this grass and looked at this sky." I sent a copy of it on to Jan, who immediately agreed and soon began to write. Twilight is an enchanted time for Tolkien, when the two lights mingle, first the light of the Two Trees, then the light of their fruits, the Sun and Moon. 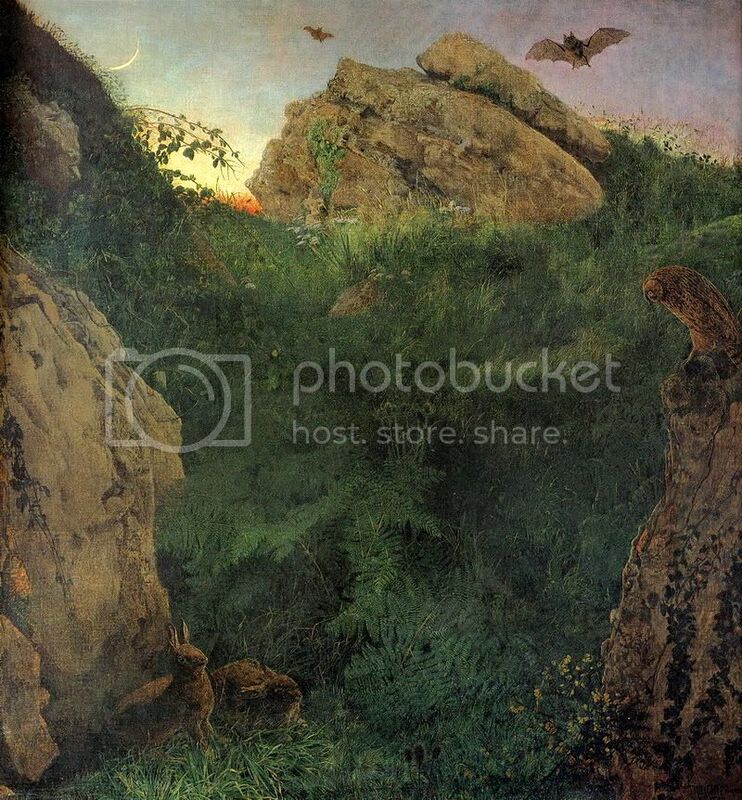 In Webbe's painting, the red of the sinking sun can still be seen between the rocks, but a pale crescent moon hangs above it. This magical light, illuminating the lovingly detailed grasses and plants, rocks and small creatures, creates a sense of hushed wonder. Even the rabbits seem to pause, the owl waits, breathing slowly, taking in the fragrant air, even as it cools with coming night. Perhaps the insects are already beginning to chorus. 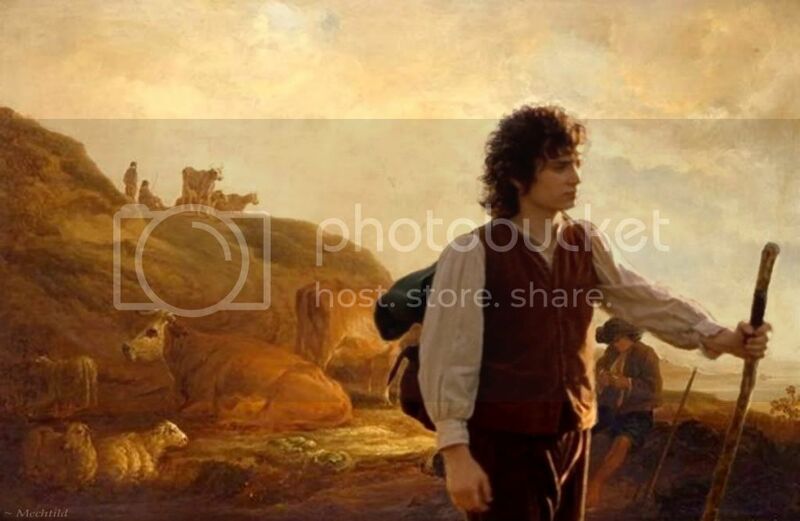 I actually tried to make this painting into a Frodo manip, using a full or partial figure of Frodo from a screencap, but the resolution of Frodo in mid-distance shots is just too muddy to match the crisp detail of the Webbe image even remotely. It could not be done, or not by me. Still, I want to show you this painting, an image of the Shire as I live and breathe. How I would like to see it in person. Although I could not make a manip out of the Webbe, I still wanted to post a Frodo illustration for this poem, full as it is of Shire imagery. I have come up with two, one to precede the poem showing Frodo striding into the morning sun in a country setting, and one to come after, showing Frodo looking back as he treads a shaded woodland path. Before the manips and poem, I will show their elements and briefly tell of their making, for those who like that sort of thing. 1. Frodo striding in the morning sun in Aelbert Cuyp's "Landscape With Cattle". Sunlight in his paintings rakes across the panel, accentuating small bits of detail in the golden light. In large, atmospheric panoramas of the countryside, the highlights on a blade of meadow grass, the mane of a tranquil horse, the horn of a dairy cow reclining by a stream, or the tip of a peasant's hat are all caught in a bath of yellow ocher light. The richly varnished medium refracts the rays of light like a jewel as it dissolves into numerous glazed layers. Cuyp's landscapes were based on reality and on his own invention of what an enchanting landscape should be. 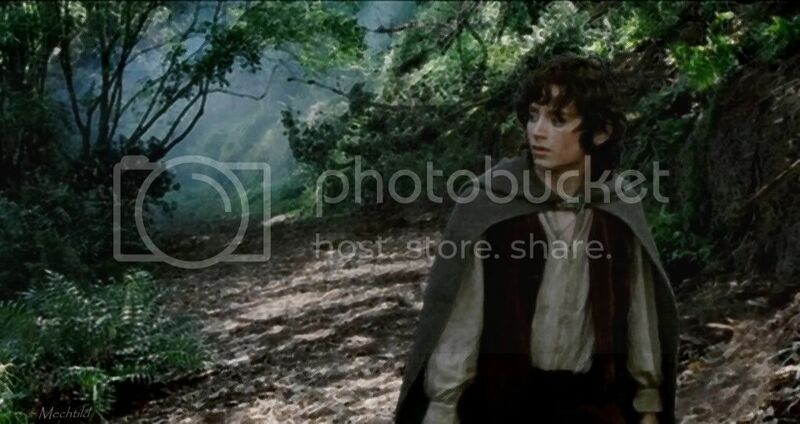 When it came to making my manip, in order to emphasize the sense that Frodo is walking in the early morning, I reversed the image. In the original painting, the sunlight is pouring in from the left. The habit of looking at maps is so ingrained in me, however, I automatically think of the left side of a picture as the west and the right as the east. It's silly, I know. Cuyp could easily have painted this scene looking south, so that the east would be to his left and the west to his right. But to my visual sense, east light has to come from the right. So I flipped the image. Happily, in the selected screencap Frodo is already facing the right, walking into strong sunlight. The lighting is so well matched between painting and screencap, it was not difficult to work Frodo's image into Cuyp's painting. After I finished the hand-tweaking, I applied a light paint filter to Frodo (trying to better match the look of the painting). 2. Frodo on a Shire path. Reading Jan's poem, I knew I wanted to show Frodo in the woods as well, in something that suggested the broodier, slightly melancholy undercurrent of the piece. An image of Frodo in RotK came to mind, from the EE Crossroads scene. He and Sam have just seen the sunlit flower-crowned stone head in the grass, the shadows close in again, and they move on. Frodo's face as he walks looks thoughtful but a bit anxious in the frames, but I thought it would read as observant and reflective in a Shire setting. Still-bare Ithilien isn't the Shire, though, especially the Shire celebrated through Frodo's eyes in Jan's poem, so I needed to put Crossroads Frodo somewhere else. I didn't have a painting that would work, but it occurred to me I could use a Shire screencap. So I selected a frame from the "Get off the road" scene in FotR, a view of the woodland road dappled with sunlight, took the hobbits out of it (painting in substitute scenery with the clone brush), and imported Frodo from the scene in Ithilien. After tweaking the colour and lighting to get a match between the caps, I worked with the lighting and colour of the joined images to make the woods shadier, darker, and cooler. But it still looked like a screencap. I wanted it to look more like an illustration, so I applied a layer of watercolour "traditional" to the entire image. I also cropped it, so that the focus was more on Frodo looking back at the path behind him, the Road winding back into the curling mist. I wanted to evoke a sense of Frodo looking back not just at the path but what he's been through, where he's come from, even if he's now in the Shire, treading a familiar woodland road. in the velvet smudge of dusk. should prove dismayed in his hunt. ~ Album of all Frodo Art Travesties (a gallery of images only—be sure to enlarge images after opening). Jan's poem really *is* exquisite. 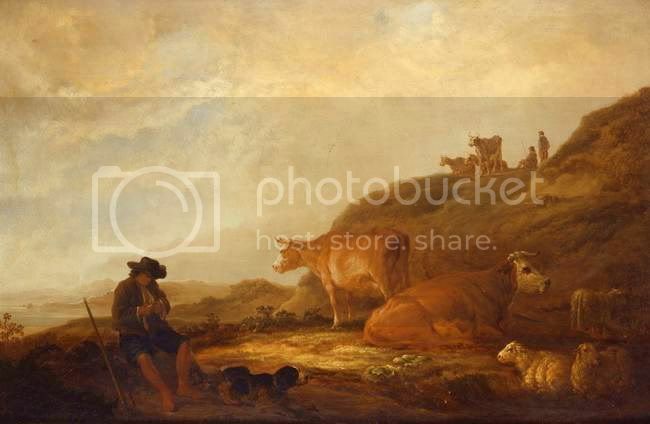 I love the Cuyp-based manip (cattle in sunny meadow), too. But I love the painting in the first place. The screencaps that made up the second manip are just screencaps (but I am sure someone really good at photoshopping could have done something more interesting with it). Still, the image I love best is still Webbe's "Twilight". How I would love to have a large, good copy of it. I thought his 'Twilight' painting had a strong PreRaphaelite influence. :) It's beautiful, very dreamy and mystical, I love the light! It has that 'super-real' effect the PreRaphaelites strove for. In the screencap of Frodo and Sam leaving the Shire, it looks like the crow perched on the scarecrow behind Frodo is actually perched on his head, LOL. I love the way you describe Frodo walking in the Shire, Pearl. Yes, he does have a "strong and determined ... and somehow wistful" look to him. It's the light that fires me, though. What a lovely image of Frodo in the Shire. The Webbe: actually, I put that link in the post, but under the artist's name. But perhaps I need to say something like, "read more about Webbe here", and put the link under the "here". That's what I usually have done. ETA: I went ahead and made that change, Pearl. I really do love that Webbe painting. And while I can see his relation to the Pre-Raphaelites in terms of style, I can't picture most of my Pre-Raph guys painting purely a landscape. A landscape in which to put a subject, yes, a woman (or a goat, like Holman Hunt), or a larger pictoral narrative, but a landscape as such, a picture with no people, no tale or moral or allegory to illustrate. In that he reminds me of the Renaissance Dutch and Flemish masters, not so much the landscape artists who depicted complete scenes, but the ones whose paintings of faithfully, almost reverently rendered patches of turf, vases of flowers, or produce spread across a table cloth can make me weep. arms of time.</i *sigh* This poem is very dreamlike indeed. Beautiful. The manips are really lovely. You did a great job. It's interesting you should call it dream-like, Shirebound. In a conversaton about the poem and post as I prepared it, Jan said she wasn't sure Frodo wasn't dreaming in the first part. Maybe walking and dreaming at the same time. I suppose only Frodo knows. :) Thanks for commenting, Shirebound. Looking at your beautiful manips and reading Jan’s beautiful poetry has made me nostalgic. Hi there! Did you just change the first picture? Hello, lass! Jan has done another ravishing job, hasn't she? What a painter she is with word images, as good as Webbe or Cuyp. P.S. Yes, I did change the first image, the "teaser" (it's all that shows when people are scrolling down the friend's list). I thought it was more luminous and gave more of a sense of the larger poem than the dark woods. Lovely, lovely work as always - both of you! I'm sure young Frodo and little Sam are somewhere just out of "shot" in that first painting - maybe scurrying to get home in time for supper! And for the rest, your two manips and Jan's poem are perfect companion pieces. It's always such a pleasure to look at your entries. Thanks, Telstar. I'm happy the post, poem and visuals, has given you LotR pleasure. :) Isn't Webbe's "Twilight" a quintessential Shire image? I found a place on line that sells painted copies of it, but I'd rather have a good print of the real thing -- or the real thing, lol. It's dreary here, too, Paulie. Grey, grey, grey. But I'm so glad you were able to see this! What a tonic to see Frodo striding into the sunlight like that. I can almost see and hear him take a big, refreshing breath of the Shire morning air. Jan's poem, ah, it's a painting in itself. She's an artist. Oh both are very lovely and well-done! The first one is so very uplifting and positive. It's almost as if Frodo is the reason everything around him looks so golden and beautiful. Very intresting post. Thank you!